At first, George’s goal was to complete the Mt. Washington Road Race at the age of 100 and drop dead at the summit, haha… But, following Trump’s election as president, George now wants to live to be 101 so he can find out the results of the 2020 presidential election and drop dead after the 2021 race to the top of the Rock Pile, hahaha… All kidding aside, George Etzweiler is a force of nature at the age of 97. What is it about the Mt. Washington Road Race that inspires such unfathomable courage, strength and resolve in George?…and, George is not alone! 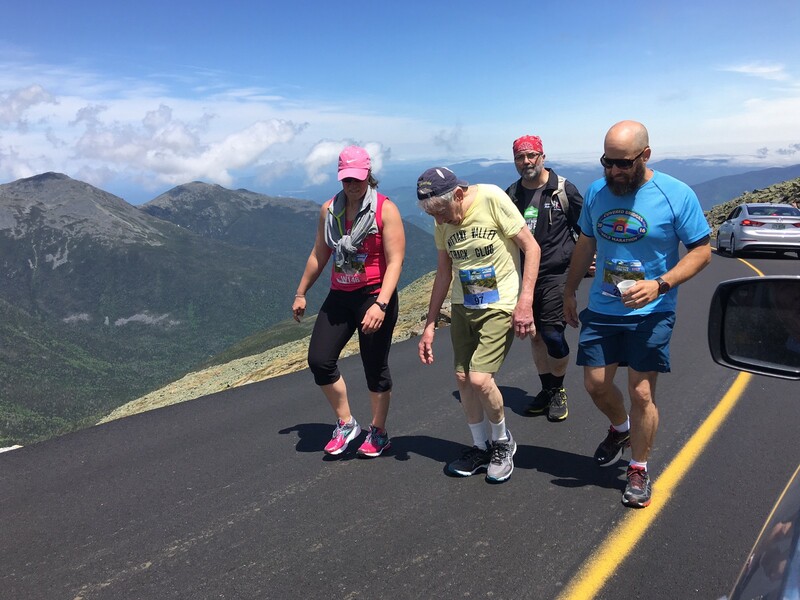 Well, he is in a category by himself in terms of his incredible longevity and fitness, but many elder runners, and elder-elder runners flock to MWRR. What’s going on here??? Let’s compare some numbers from the MWRR to the MillenniumRunning RibFest 5 Mile, held the day after, Sunday June 18th, 2017. First, do you think more men or women ran MWRR? RibFest? Men still outnumber women at MWRR (64%) but women outnumbered men at RibFest (54%). Second, how about elder runners? If we divide runners young-from-old at age 40, do you think there were more younger men and women (<40) than older (>39) at MWRR? RibFest? At MWRR men were older with 70% over the age of 39, while women were younger with 60% under 40. At RibFest, men were a little bit older with 53% older than 39 and women were older with 66% over 39. The oldest man at RibFest was 83 and George, of course, was 97 at MWRR. The oldest woman at RibFest was 73 and at MWRR was 78. 1048 runners finished MWRR, 1778 runners completed RibFest. George Etzweiler has finished the MWRR 10 times in the past 12 years - that is, since he turned 85. Each time he has run he has set an record for his age at the time.